Color....I love color. I can't say there is a shade under the sun I don't love. And cobalt....cobalt is probably in my top 10. It's rich blue is the color of Mediterranean water and compliments white perfectly. I wore this dress late Summer as a sheath when the temperatures were warmer. 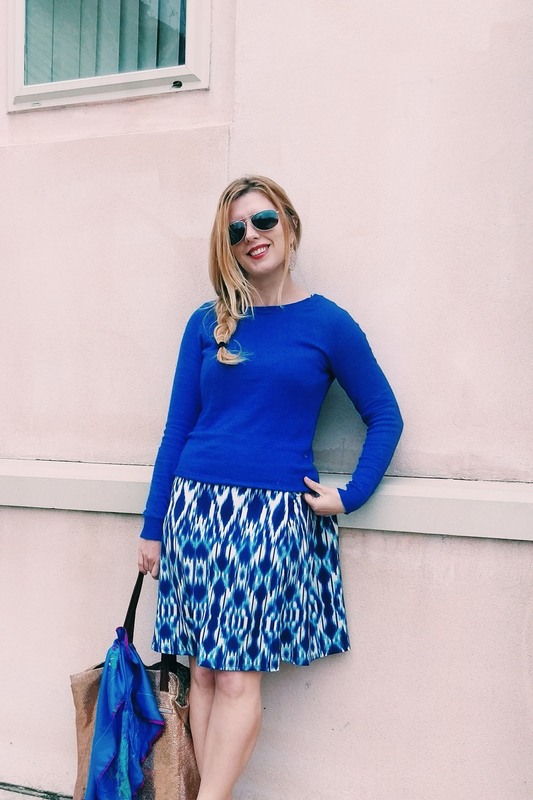 I love the Ikat pattern and with a simple crew neck thrown over - it easily transforms into a skirt. Crew neck sweaters and tees are a staple in my closet. 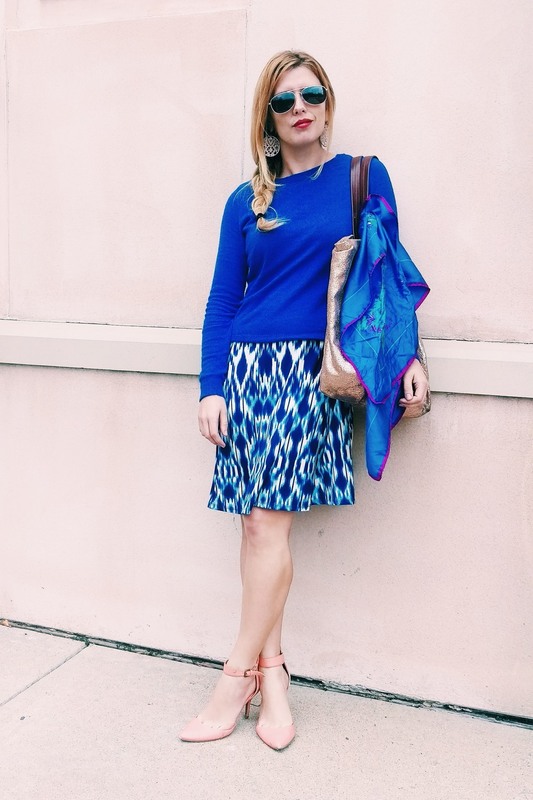 With their high neckline it really is easy to just grab a dress and throw the sweater over it. A perfect work outfit and would also be good to carry in a suitcase for mixing and matching outfits. 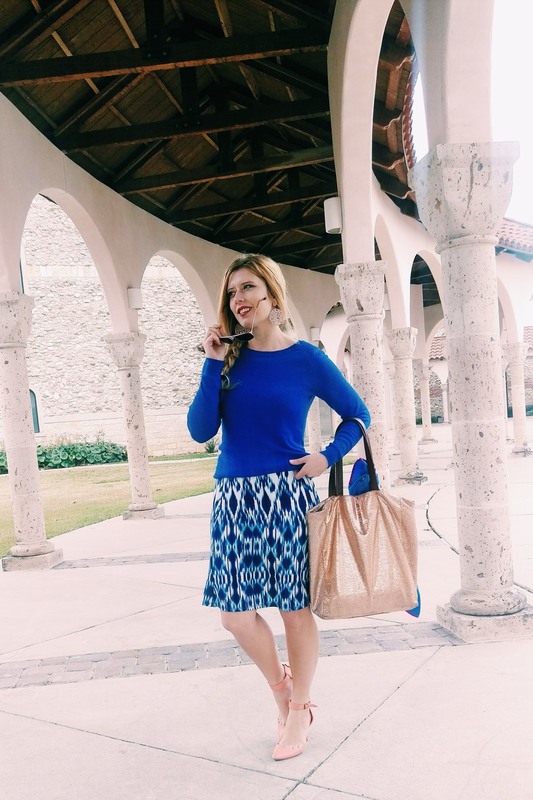 Cobalt looks good with an array of colors, but I thought a pair of peachy hued pumps would look great and still elongate the leg. This tote is one of my favorite things I've worn over the past few years. It has a crackle texture and is roomy enough to carry all the items I need at work including a laptop or tablet. Some statement earrings and rose gold rimmed sunglasses were easy accessories for this office look today.